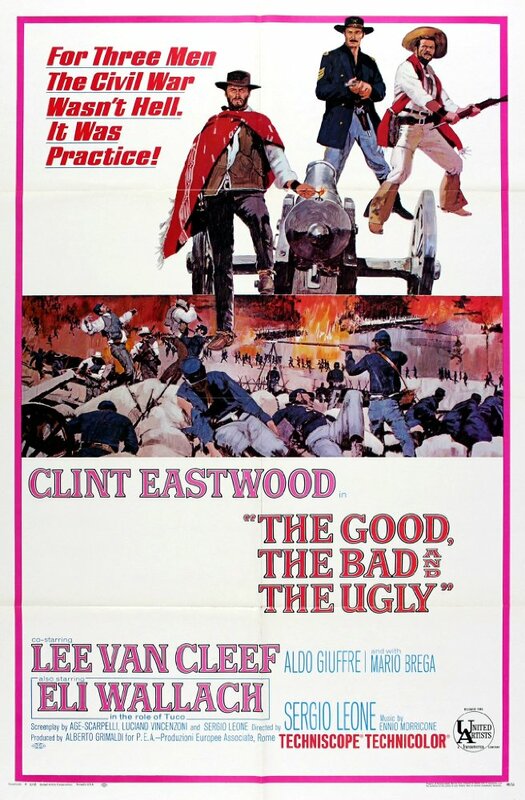 they was the good they was the bad and they was the ugly.the good the bad and the ugly.this is the best movie of 1966 by far I mean the score in this movie was Brilliant and the actor who played the ugly is funny as hell. A simple morality play takes place on the grandest of scales in Sergio Leone's greatest Western. The film's characters are each their own intriguing persona and the ensuing power struggle makes for some of the greatest scenes of the genre. Add to this Leone's beautiful panoramic photography and the film's iconic score and this is a true Western classic. Westerns don't get better than this. The Good, the Bad and the Ugly is my favorite Western of all time. It has so much to love, that you forget there was a world based on laws. It's just thrilling scene by thrilling scene, and is always a pleasure to watch. The acting is fantastic. Eli Wallach displays an almost tongue-in-cheek humor as the vicious, pitiless bandit Tuco. Blondie! I kill you! Clint Eastwood continues his charade as the Man with no name, and he's fine with me. As a cowboy, he passes it off very well. No posts have been made on this movie yet. Be the first to start talking about Good, the Bad and the Ugly, The ( buono, il brutto, il cattivo, Il )!